Then the questions hit me hard. I was pretty tight-lipped as to what the mysterious eight events were and planned on not revealing any of them until the moment we arrived at the given event. Veronica and Katelin wondering…What the heck is happening? “Just follow my lead,” I would say to them. “I’ll let you know how to dress and what you should bring.” I wouldn’t let any of them go in unprepared. It’s the least I could do. However, for the first event only, I told them what we were doing to curb their anxious minds. “We’re going white water rafting, bright and early in the morning!” I revealed to them. I wanted to lie and pretend we were doing something else completely different to throw them off, but decided that I’ve been lying to them enough lately already. Alaska has been blowing my mind with its mesmerizing landscape in every direction I looked. The spruce woods and mountainous ranges extend as far as the eye could see. Anything we chose to do here would be complemented with the background scenery. This place is a photographers dream zone. 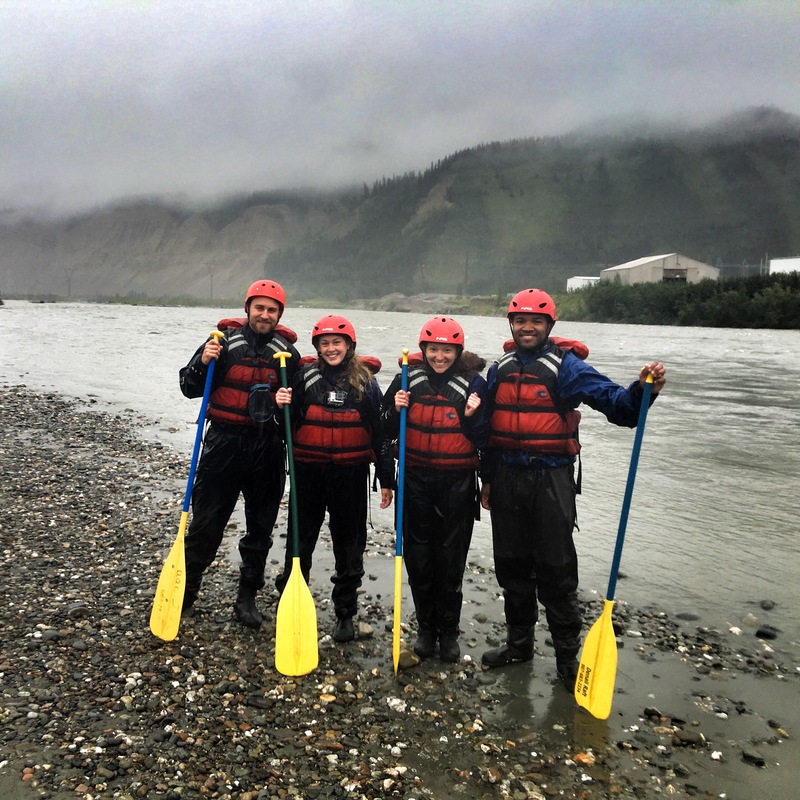 Our white water rafting through the rapids of the Nenana River, from the births of Mount McKinley, was about to be awesome! 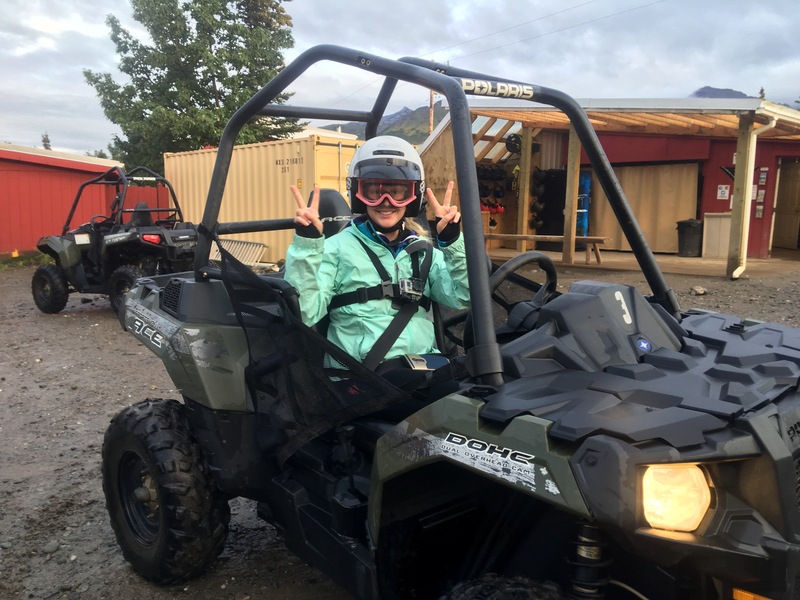 We went to a shop just outside of Denali where we were suited up in an outfit to keep us dry in Nenana’s freezing cold waters. Our guides for this hike were three dudes by the name of Chicago, Peacock, and Derek. All three were non-locals and were up here in Alaska for the summer. As a matter of fact, most of the people who worked in these shops weren’t locals and were only here for summer work. Why? The winters here are the worst thing to ever exist and it was understandably so. Even during the peak summer season, although it didn’t snow, it sure did rain a lot. Actually, more of a drizzle that created an everlasting haze, but it added to the mind-soothing eeriness of it all. It drizzled the morning of our event, but none of us seemed to mind. Especially since the suits we were wearing kept our bodies snug and dry. Katelin, Veronica, and Chris ready for the first event. I’ve been white water rafting several times on previous trips. My first time was in Peru which was amazing. Then again in Thailand and Nepal. Nepal takes the prize as the best water rafting I have ever done, mainly because of the consistency of the high class rapids and the number of times our raft flipped. In order to have the perfect rafting experience, the raft has to flip and throw us off! I planned on asking our guide to make sure our boat f*%ing flips. Go crazy! I had high hopes…until I saw the other people in our raft. They were of the elderly type…the safety first, peaceful, ‘Heavens to Betsy’ elderly type. Still, I remained optimistic. 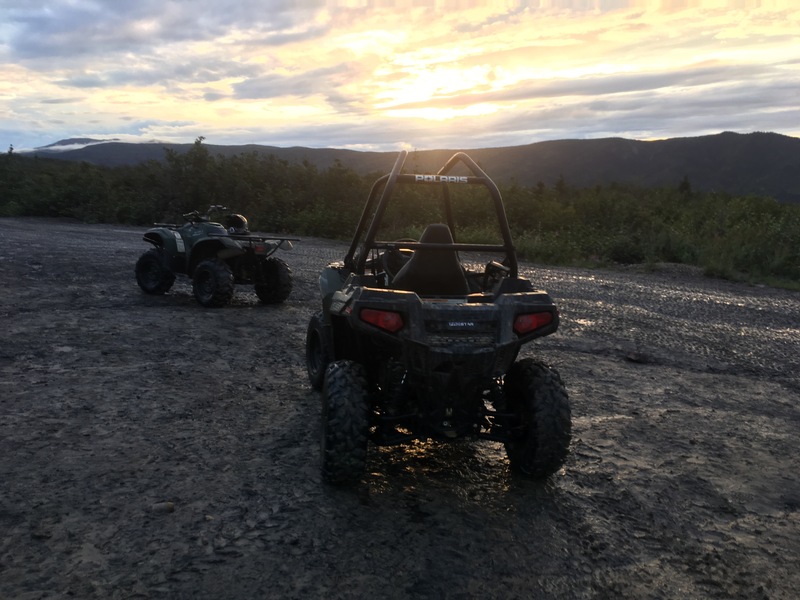 The Nenana River flowed a muddy gray through the basin as our raft propelled neatly on top of the motions. We were given brief instruction about proper paddle commands and procedures before we took off. This was going to be about 11 miles of rafting, so my hopes of hitting some major swirls were high! 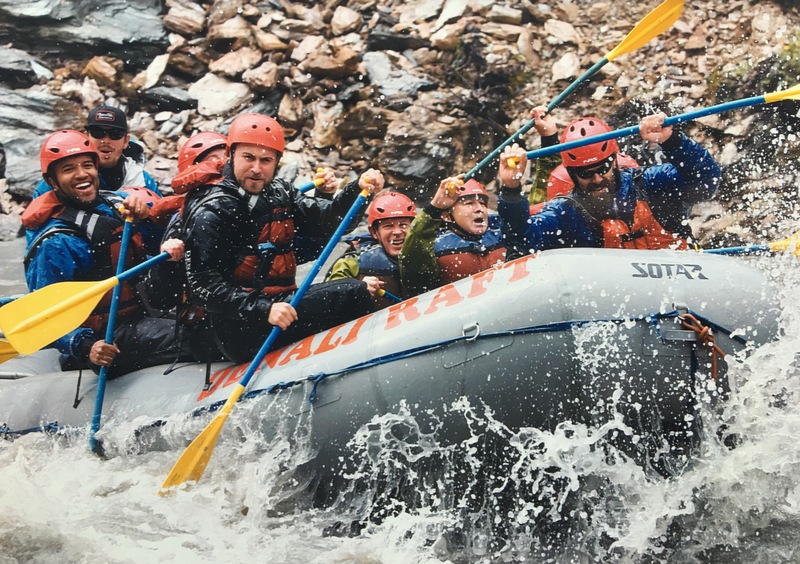 Just like most white water rafting trips, the rapids eased us into itself before hitting us with the good stuff. We did get splashed in the face quite a bit, but only our hands and heads got wet. The dry suit we had on worked wonders and thankfully too because the water was really, really cold. Refreshing, but cold. We hit a few rapids that ferociously rocked our raft. Not fierce enough for anyone to fall out, but enough to get decked with onslaughts of water blasts. I began to think we wouldn’t flip when I noticed our cautious guide avoiding all the higher class rapids, much to the delight of the elderly woman behind me. I had my water camera on me and whenever I stopped paddling to capture the thrills, she would indirectly make it known to me how everyone should be paddling. “Keep paddling! Everyone needs to be paddling!” She would say this everytime I plopped up my camera. She also did this when Katelin tried to do the same thing. “Everyone needs to be paddling!” Talk about a wet blanket. We paddled for a couple of hours before our guide decided to let Chris and I jump into the water. It was crazy how dry I was and the cold didn’t penetrate one bit! 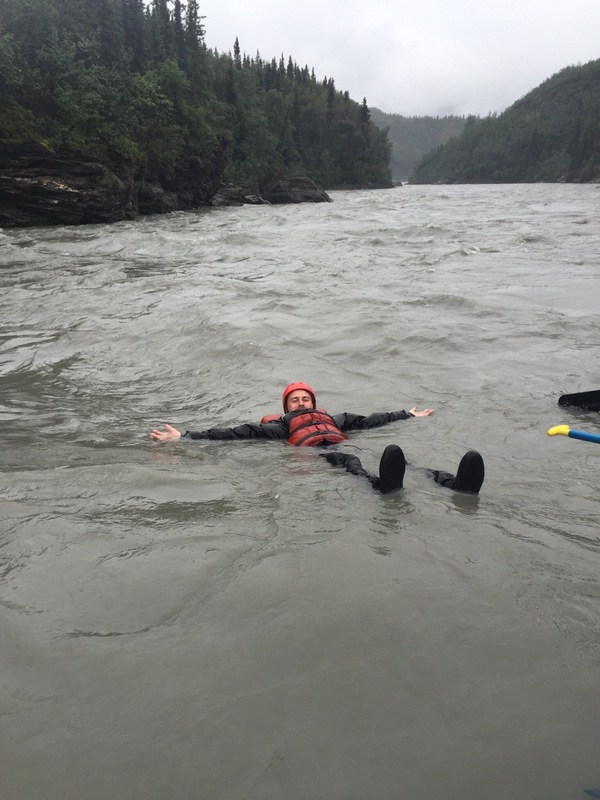 I grabbed onto a rope to make sure I didn’t get swept away before being hoisted back into the raft. From there, it was smooth sailing as we approached a bank to get back on foot and the end of event #1. 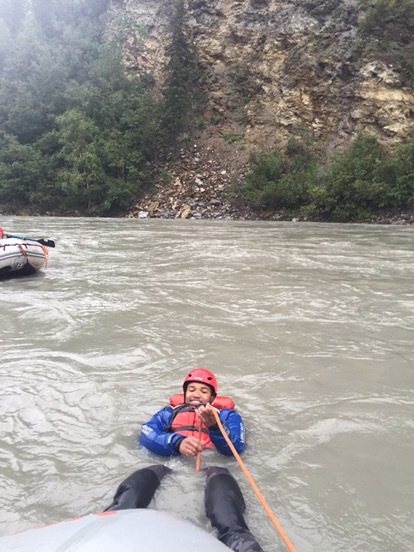 White water rafting is always fun no matter the conditions. Even though it wasn’t as extreme as I had hoped, it was still mighty enjoyable and a great way to kick off this League of Eight Extraordinary Events! The second event took place on the same day but hours later, at 9:30pm (21:30). One would think it would be dark at this time but not here in Alaska. 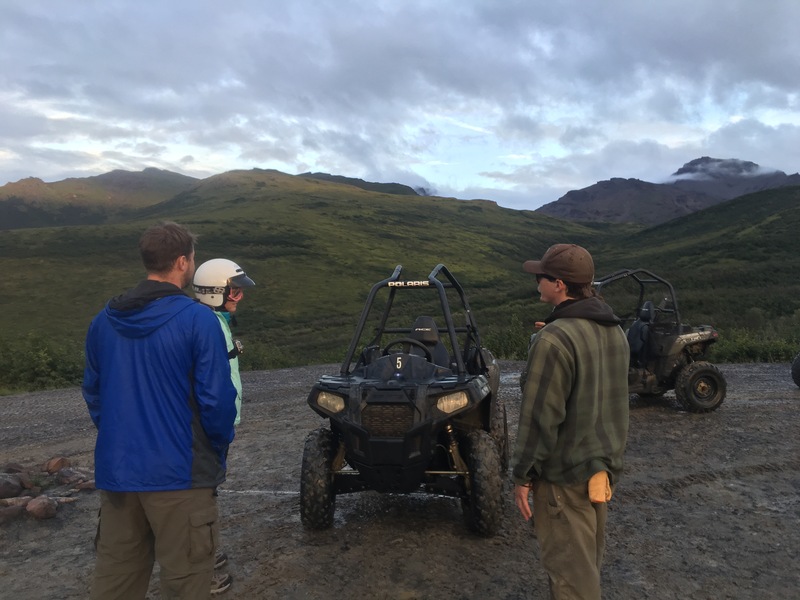 This time of year in Denali it doesn’t get completely dark until well after 2am (02:00). 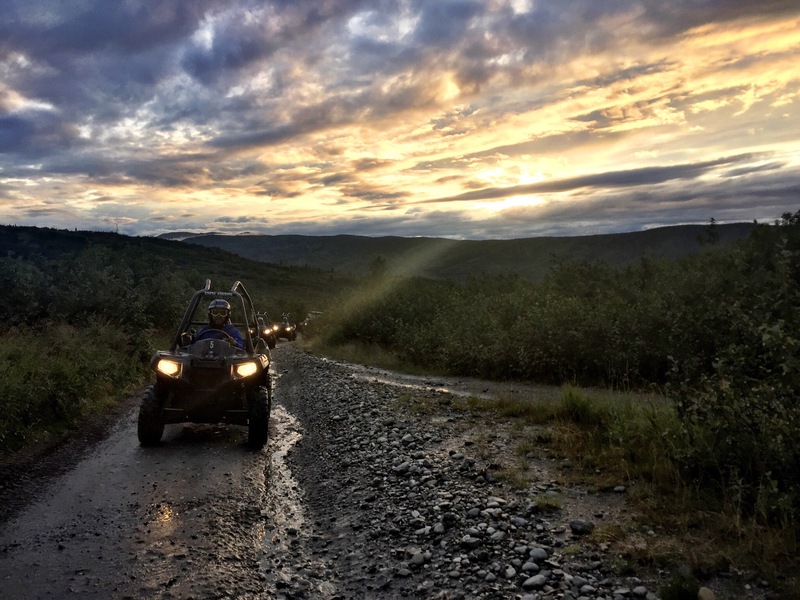 What better way to explore the wilderness late in the evening than on single rider Ace ATV’s? 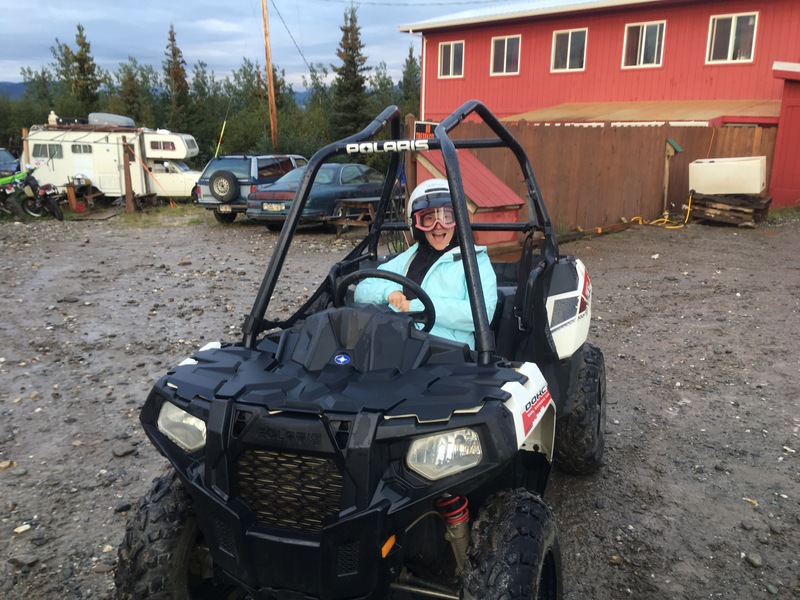 Veronica, Chris, and Katelin didn’t know what they were doing until we walked up to the ATV Denali shop when it became obvious. We’re going for a ride! The best thing about this tour was that it was just the four of us and two guides, no one else! So no waiting on slowpoke tourists or sitting through dumb tourist questions. We had this tour to ourselves. The guides preffered the smaller group too. 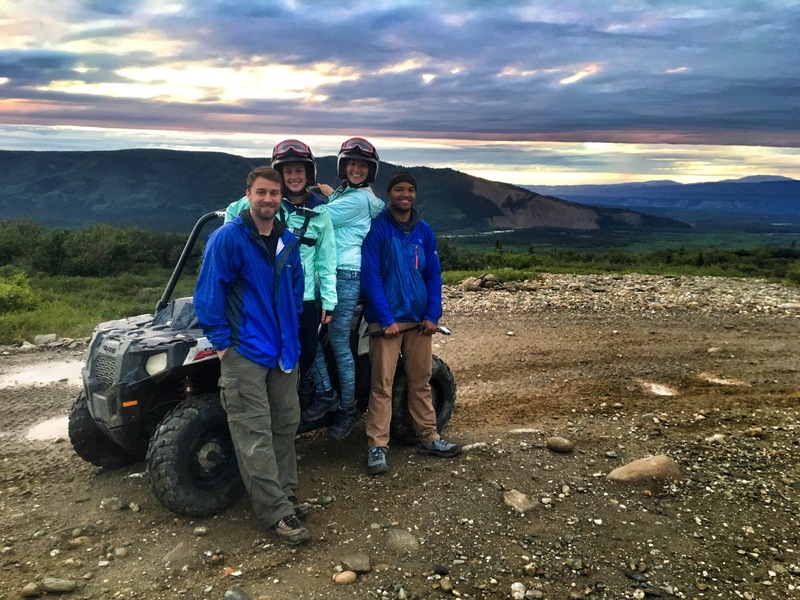 We each had our own Ace ATV to explore the Alaskan wilderness as we followed our guides through some pristine spots with excellent views and a story or two. The ride was excellent and way more fun than I anticipated. It was well past 10pm(22:00) and still light as day outside which was really weird. We could see the sun attempting to set but it was taking forever to do so. Such a beautiful tease. The second event ended the day on a thrillingly high note. Two extraordinary events down, six more to go! My clueless friends are unware that things are about to get intense. Great post! Would love to go to Alaska too!